We’re going on year three of having a book advent calendar to celebrate the season. Here are some books you might want to add to yours. Affiliate links included for your convenience. Also, as a Parragon Book Buddy I received several of these books (noted with an asterisk) for free to review, but all opinions are my own. I’m a little late to the game this year, but I’m finally pulling out all the holiday books and figuring out what we have that can go in our book advent calendar this year. Between our old tried-and-true favorites and a few new picks, I think I’m just about ready to go. 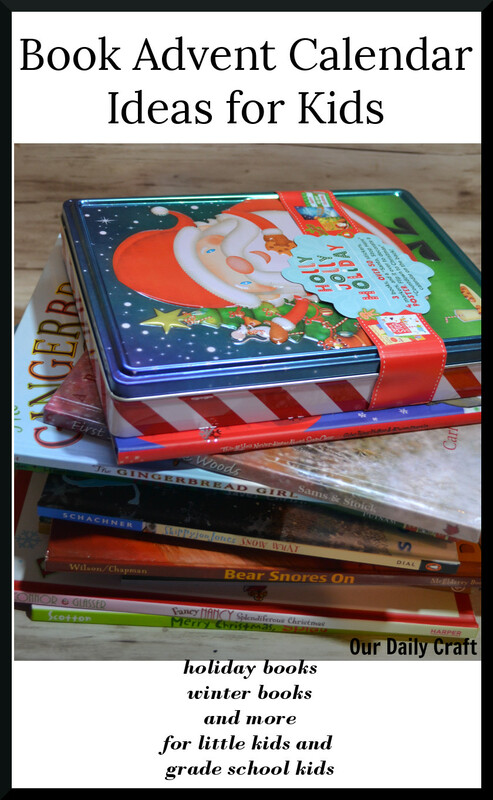 I thought you might be interested to know about some of the books we’ve included in our book advent calendar through the years and how to make it a successful project for kids of different ages. We didn’t start doing a book advent calendar until the girl was six, but this is something that can be fun with little kids, too. Friendly Little Snowman* illustrated by Samantha Meredith, is an adorable book with sweet illustrations, and the copy I have has a built-in snowman finger puppet you can wiggle while you read. Hello Christmas* is a sweet little peekaboo book with cutouts on each page that give a hint to what will be on the next page. Perfect for babies and toddlers. Daniel Plays in the Snow adapted by Becky Friedman. If your child loves “Daniel Tiger’s Neighborhood,” this book about the right way to get ready to play in the snow (based on an episode of the show) is sure to please, and it includes stickers for snow day fun. Happy Bird Day by Carl R. Sams II and Jean Stoick is full of pictures of real birds in the snow and a fun read for nature-loving kids. Winter Friends is another of theirs featuring animals interacting with a snowman that is really cute (my 8-year-old still loves these because of the funny pictures). Snow Bugs by David A. Carter is a silly pop-up book full of funny creatures in the snow. Red Sled by Lita Judge is an almost-wordless book about a sled and its many adventures with wild animals. Snowballs by Lois Ehlert is a creative book full of fun “stuff” used to embellish snowmen that’s sure to inspire kids in colder climates to get fancy with their snow creations. 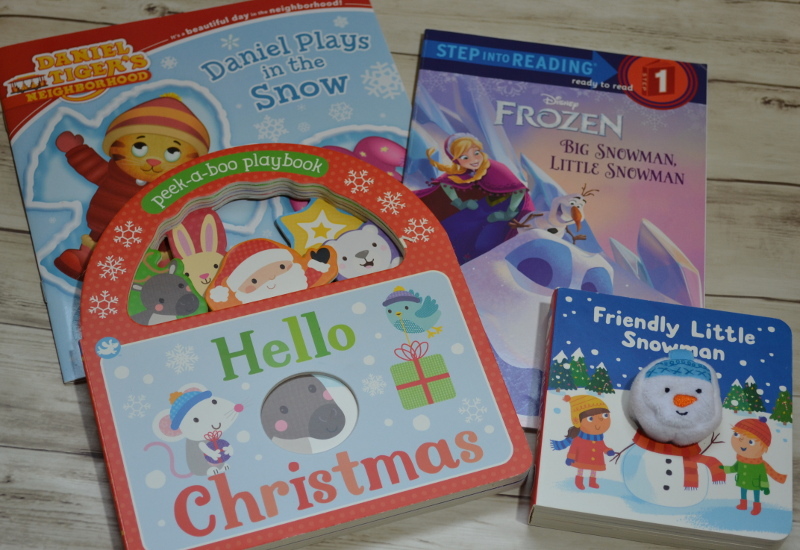 If you have a kid who loves Frozen, there are many books related to it, and it has snow, so it’s sort of Christmas. Last year I included Big Snowman, Little Snowman in my daughter’s collection (she’s not that into it anymore, though). Merry Christmas Elmo is a play-a-sound book that includes three songs, which my daughter really liked when she was younger. There are many Sesame Street themed Christmas books, if that’s a thing your kid is into. If you kid/s are a little older, there are still plenty of great books out there with a holiday theme you can choose from. Here are a few of our picks. Kick your calendar off with the Holly Jolly Holiday tin*, which includes a countdown calendar with stickers (with a “Santa stop here please” sign to decorate on the other side), activity and coloring books and a small paperback copy of The Night Before Christmas. Things You Never Knew About Santa Claus* by Giles Paley-Phillips and Rowan Martin covers some lesser-known facts and hobbies about the big man up north, including his favorite snack food (cold pizza) and a pet you might not have known he has (a dragon named Blaze). Snowman Magic by Katherine Tegen is a book the girl got from her teachers last year. It tells the story of a special snowman who comes to life to play with a little boy. Annie and the Wild Animals by Jan Brett is maybe not as well known as The Mitten (which we love, too, of course), but I love this funny story about a girl whose cat runs off and she tries to lure a new pet from the forest. The depictions of knit items, as usual, can’t be beat. Speaking of Jan Brett, we also have her Gingerbread Baby and Lisa Campbell Ernst’s The Gingerbread Girl, which are both fun retellings of the gingerbread getting the better of humans and animals alike. If you want to throw some winter books into the mix, First Snow in the Woods by Carl R. Sams II and Jean Stock is a great one for older kids, which talks about how the animals get ready for the snow. Bear Snores On by Karma Wilson and Jane Chapman takes a funny look at hibernation, while Over and Under the Snow by Kate Messner looks at what the animals in the forest are doing when it’s cold outside. Judy Schachner’s Skippyjon Jones Snow What is a fun retelling of Snow White with our favorite kitty/chihuahua cast as the reluctant prince, and Pete the Cat Saves Christmas is sure to be a hit with fans of that cat, too. We also enjoy Merry Christmas, Splat by Rob Scotton (can you tell we are cat people?). 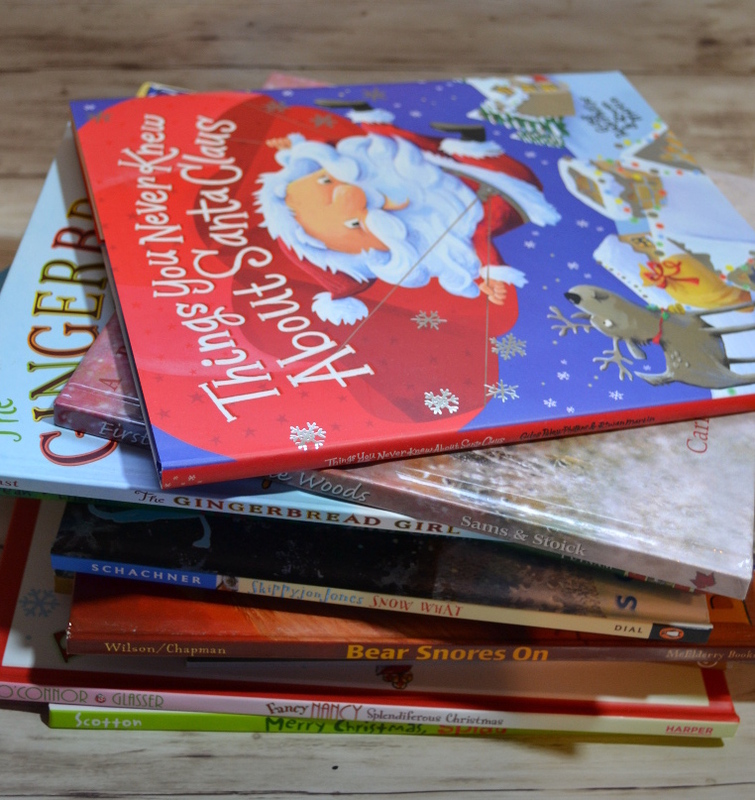 Lots of your kids’ favorite characters have holiday books, including Fancy Nancy, Amelia Bedelia and Olaf from Frozen, to name a few we’ve read and enjoyed. The Polar Bear Who Saved Christmas by Fiona Boon is a cute story about a bear who stands in (flies in?) for an injured reindeer, and you can’t go wrong with a classic Rudolph the Red-Nosed Reindeer story book. Retellings of classic winter stories are a fun addition to your book advent calendar. We have The Nutcracker* and The Snow Queen* in editions with beautiful illustrations by Valeria Docampo and Charlotte Cooke, respectively. I always use our The Night Before Christmas illustrated by Mary Engelbright for Christmas Eve. We probably need a new Hanukkah book, but we read The Count’s Hanukkah Countdown on the first night of Hanukkah. 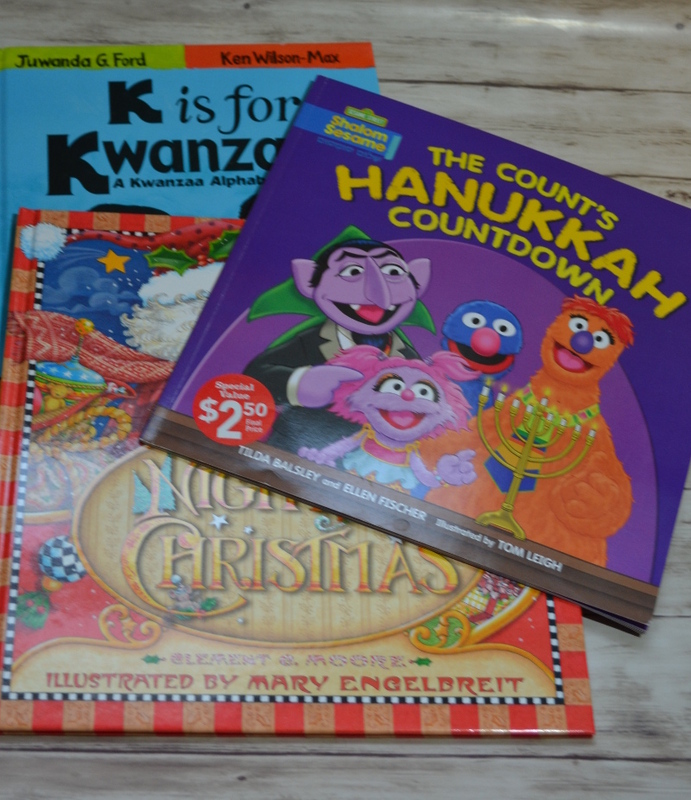 I also have a Kwanzaa book, K is for Kwanzaa by Juwanda G. Ford and Ken Wilson-Max, which I used in the advent calendar last year but will probably make a bonus book this year since Kwanzaa doesn’t start until after Christmas. If you want to get even more diverse with your book list, check out these recommendations for multicultural winter holiday picture books from What Do We Do All Day? And The Twelve Days of Muppet Christmas could be one for 12 days from Christmas, if I wanted it to be. A book advent calendar does not have to be just holiday and winter books. I always include some kind of activity or cookbook on the first day the girl is home from school for winter break (this year it’s Rosie Revere’s Big Project Book for Bold Engineers). There’s usually a coloring book or a craft book and a chapter book or two on some subject or from a series that she’s into. This year it’s How to Train Your Dragon book two, because for some reason they don’t have a copy at our local library. Between holiday books you already have, books you might have purchased but not given your child and things in the house that haven’t yet been read, you should be able to pull together a fun book advent calendar that will keep your family reading throughout the season.